By covering a total area of approximately 30 hectares, amidst a picturesque landscape of green hills, the Suban Hot Spring is the perfect place to rid yourself of all tensions of the bustling day and intimate yourself with the warmth of nature. The water that fills the pool is drawn from a number of springs that flow down from the Bukit Kaba Hills are channeled through bamboo pipes. Aside from the open pools, there are also a number of bathing cubicles where one can enjoy the fresh warm water in better privacy. Suban Hot Spring is lies just below the hills of Bukit Kaba in the highlands of Bengkulu Province, a find pool of rejuvenating warmth surrounded by the lush beauty of nature. 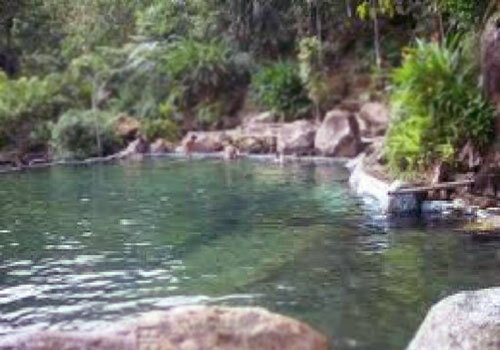 This Hot Spring is precisely located at the Penantian Village, East Curup District, Rejang Lebong Regency, Bengkulu. Within the pools area you will see two boulders that are considered sacred by the local people. The first is the Batu Tri Sakti or Tri Sakti Stone which is said to be inhabited by three great spirits who protect those who visit the hot spring. The second is Batu Menangis or literally the Weeping Stone, which is said to occasionally emit water as if it was crying. The existence of batu Menangis relates to the legend of a certain princess named Gemercik Emas who constantly sobbed, since she refused to be forcefully married to a prince named Putra Gambir Melang. The Suban Hot Spring is located about 6 Km from the Town of Curup, capital city and main hub of the Rejang Lebong Regency,and lies at the main road between Curup to Lubuk Linggau. From Bengkulu City, capital of Bengkulu Province, the overland trip will take approximately 4 hours. If you wish to use public transport, you can catch the Bengkulu-Curup Bus. From Curup Town, you need to continue by the Angkot (Angkutan Kota) mini van to Pasar Atas, then continue by another angkot to Suban Hot Spring.